To say I've been anxiously awaiting the return of the Netflix Original, Master of None, would be an understatement. I swear they get me every time! A new season comes out, I binge watch the entire season and then comes the inevitable cliffhanger that makes you wish you didn't have to wait another year to find out what happens next. Towards the end of Season 1 of Master of None, we learned that Dev's (played by Aziz Ansari) love for pasta had turned into more of a passion, so much that the season ended with Dev flying off to Italy, after an untimely breakup, to have an "Eat Pray Love" moment and learn to make pasta the Italian way. Of course, because I love a theme and pasta, what else would be more fitting than to binge-watch season 2 of Master of None with a bowl of sweet potato gnocchi in brown butter sage sauce with chicken sausage and kale. Coincidentally, a few minutes into the first episode Dev is seen making gnocchi from scratch. I didn't quite have the time to make mine from scratch, so I went with the next best thing... pre-made sweet potato gnocchi from 365 by Whole Foods. I hope I haven't given too much away and if you haven't seen either season, do yourself a favor and whip up a bowl of gnocchi and binge on! For the sausage and kale, heat the olive oil in a large dutch oven over medium-high heat. Add the chicken sausage, breaking it up as it cooks. Cook for a few of minutes, or until browned. Add the garlic and chili flakes, and cook for about 30 seconds. Then, add the kale, season with salt, turn down the heat to medium, and cover. Cook for about five minutes, stirring the kale occasionally. Remove the lid and let the kale finish wilting. Heat butter in a saucepan, melting it and add sage. Keep heating it until the mixture darkens and smells nutty; then remove from heat add grated Parmesan. Top gnocchi with chicken sausage and kale and then pour brown butter sage sauce over chicken sausage, kale, and sweet potato gnocchi. 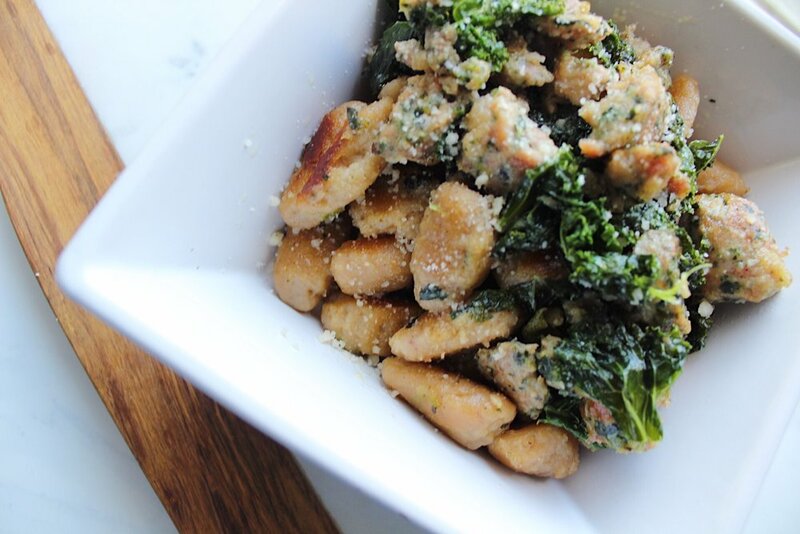 Garnish with more grated Parmesan and Enjoy!